A really wonderful piece of work, I’ve not been so drawn into and engaged with a performance in a long time. Western Ring Cycle is the acclaimed community cultural development project where busloads of audiences were taken into the private world of the Western suburbs. Aboard each bus, and without ever leaving their seats, audiences saw events, irrelevant and profound, take place in front yards, on the pavement, in cars, in house windows, on roof tops, and aboard the bus. Each journey was a show, and each show had been created in collaboration with different communities, in response to the physical and human characteristics of their streets. The Western Ring Cycle is a project based on the Passenger Theatre concept. The Passenger Theatre process is designed to be brought to other communities to create a new set of bus shows in collaboration with local artists and in response to the local geography and culture. WRC was the second incarnation of Passenger Theatre with the first being a work in Glenorchy, Tasmania for the Works Festival in 2004. Again it worked with the simple idea of heightening daily life in the suburbs colliding the ordinary with the eccentric. It succeeded in exploding myths and perceptions by inviting the audience to bring their pre-conceptions and then laugh and cry them away. WRC was a rich experience of the REAL vibrancy in ordinary streets, for both audience and participants. 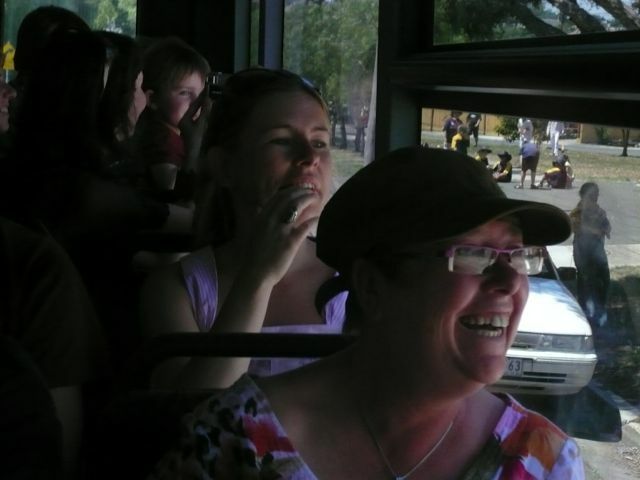 The security of the bus seat and filmic framing of a bus window, allowed audience to let themselves be challenged, be expressive in their responses and be emotionally involved. Over a period of a few months, the three artists worked with residents to develop ideas for their own private scenarios. They then designed the separate bus shows to contrast each other in terms of their location, their theatrical style, and their modes of community participation. The three concepts traversed from largely un-curated to highly directed. Within these frameworks, residents and participants invented their own material bringing wit, originality and a great sense of recklessness to their ideas. On the performance day, the buses departed from the Footscray Mall. A booth and a very funny spruiker enticed passers-by to join the current audiences on the buses. Each bus departed three times, with each of the three shows performing three times. Audience could jump off one bus and onto another. The shows were all ticketed but free. This is a really special community cultural development concept as it allows the community to participate in art making without ever leaving their street. Residents feel true ownership of the event, and celebrate their unique community with an audience brought right to their door. SHOW #1: The Frederick's - A show in a horse shoe block in Kingsville. This show was the most un-curated in that the majority of residents invented their own scenarios in their front yards. The only parameters presented were that it had to evolve in 3 chapters for each time the bus lapped the street with the same audience. The chosen block is home to incredible cultural diversity - older, very long term residents live beside African refugees, an extended Lebanese family across many houses, Chinese and Vietnamese families, as well as young Anglo Australian Families and a Catholic Primary School! SHOW #2: Dario and Angela - This show took place in a more gentrified location in Seddon where the real estate market has exploded and much house renovating is currently taking place. This work was the most filmic of the three. A soundtrack generated a suspended sense of atmosphere as a drama unfolded with a series of incidents on and off the bus. Dario and Angela positioned the audience as puzzle solvers. 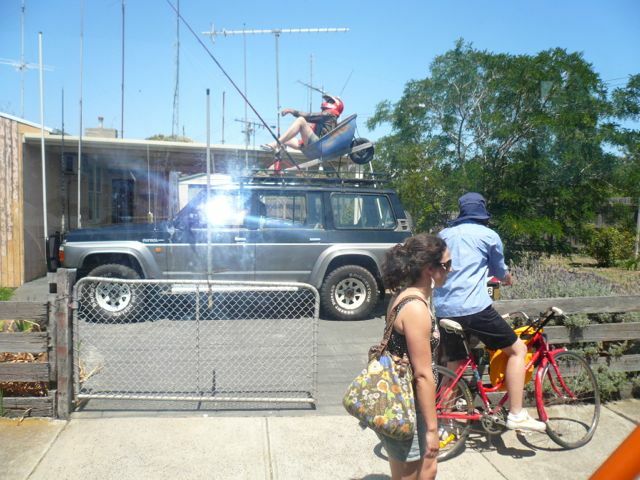 Professional performers undertook acting roles whilst residents created unusual, action based installations in their front yards. A number of events (a cricket match, a bee party for kids and a 'dress as your dog' competition), were set up and residents were invited to participate through letter boxing. SHOW #3: Mr Tanslow - The most directed of the three works, Mr Tanslow took the audience through the shipping docks to a large warehouse. Playing with the collision between an organised crime site and an over zealous workplace safety officer, this was a very comic work that involved a number of professional performers, a Harley Davidson biker, a chauffeur, a bus driver and a pile of high schools students.